This piece in FP lists the Top 100 Global Thinkers in 2010. It's a little tedious to click through them all, so I'll just tell you that first place was shared by Warren Buffet and Bill Gates (holler for the "Great Givers"!). Read this post, How to become an Expert on the Congo in Just Five Minutes a Day, for those of you who want to be Congo experts...or those of you who would like to know anything about the biggest conflict since WWII). "Out of every $100 of U.S. contracts now paid out to rebuild Haiti, Haitian firms have successfully won $1.60." I find that upsetting...read more here. Even Schloss was surprised when the algorithm they developed - based on the idea that, for instance, a thinner cookie would bake for a longer time at a lower temperature, or that more brown sugar and less butter would make the cookie chewier - worked when he started testing hundreds of the resulting recipes. But he wasn't completely sold until the breakthrough: ultimately thin, crispy cookies. "The algorithm told me to bake the cookies at 260 degrees for 45 minutes, and I thought, 'This thing does not work,' " Schloss said in a phone interview from his office in Elkins Park, Pa. "And I made the cookies, put them in the oven, and I started to redo them 'cause I just knew it wasn't going to work. And then 45 minutes later, they came out, and they were thin and crisp, and they weren't burned, and they didn't spread too far, and I went, '[Expletive], this works.' The logic of the algorithm told me to do something that as a professional cook I never would have done. Here's a bit from a NYT Opinion piece about the new Speaker and how he cries all the time. Boehner is a gravel-voiced Ohioan who wears snazzy suits and hangs out a lot with lobbyists. One of the few cheery prospects the new year holds for Democrats is his upcoming demonization, since there is no such thing in 21st-century America as a loveable leader of the House of Representatives. Unless America is totally won over by the idea of a Sobbing Speaker. In 2007, he cried while delivering a speech on the floor of the House, in support of funding for the war in Iraq. “After 3,000 of our fellow citizens died at the hands of these terrorists, when are we going to stand up and take them on?” he sobbed. Then this year, he voted against providing money to take care of our fellow citizens who became ill while doing rescue and reclamation work at ground zero after the terrorist attack. This video kills me. "Haiti in Africa" (FYI Sister2: It's ironic.) "I was so lashed I was like Lash Gordon eating bangers and lash!" And "I was literally a natural disaster. Bombed everywhere!" 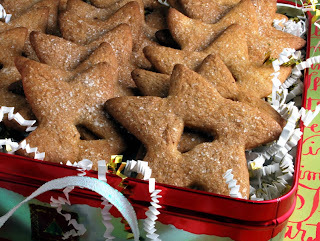 This weekend I will be finishing my Christmas shopping, and celebrating Santa Lucia day (a week late) by making Pepparkakor. Yummmm!